For more information please consult the Abel Prize website http://www.abelprize.no/. This entry was posted in Uncategorized on March 21, 2018 by sm. The IMU Executive Committee held its annual meeting at Centre de recherches mathématiques (CRM), Université de Montréal, Montreal, Canada, on Saturday/Sunday March 10-11, 2018. Winners of the second Mathematics of Planet Earth (MPE) competition of modules for the Open Source MPE Exhibition will be announced by the Chair of the jury, Mireille Chaleyat-Maurel, during an MPE Exhibition taking place at Imperial College (London, UK) on October 21st 2017. More details at http://www.mathofplanetearth.org. This entry was posted in Uncategorized on October 21, 2017 by Blog Administrator. Maryam Mirzakhani, the world’s first woman to win the Fields Medal, passed away. The Fields Medal was awarded to her in 2014 for her outstanding contributions to the dynamics and geometry of Riemann surfaces and their moduli spaces. Born in 1977 in Tehran, Iran, Maryam Mirzakhani received her PhD in 2004 from Harvard University. From 2004 to 2008 she was a Clay Mathematics Institute Research Fellow and an assistant professor at Princeton University. She was a professor at Stanford University. Her honors include the 2009 Blumenthal Award for the Advancement of Research in Pure Mathematics, the 2013 Satter Prize of the American Mathematical Society, and the 2014 Clay Research Award. Representative of the many contributions commemorating her is this tribute to M. Mirzakhani. This entry was posted in Uncategorized on August 4, 2017 by sm. The Ramanujan Prize Selection Committee has announced that the 2017 Ramanujan Prize for Young Mathematicians from Developing Countries will be awarded to Eduardo Teixeira of the Federal University of Ceará, Brazil. The prize is in recognition of Teixeira’s outstanding work in Analysis and Partial Differential Equations. For more information, see the ICTP announcement below. This entry was posted in Uncategorized on July 3, 2017 by sm. The IMU Executive Committee held its annual meeting at De Morgan House, London Mathematical Society, London, UK, on Saturday/Sunday April 1/2, 2017. This entry was posted in Uncategorized on April 9, 2017 by sm. This entry was posted in Uncategorized on March 21, 2017 by sm. The Fields Institute for Research in Mathematical Sciences, http://www.fields.utoronto.ca, will be hosting the Fields Undergraduate Summer Research Program, which welcomes undergraduate students from around the world for a rich mathematical research experience in July and August. This competitive initiative matches students with faculty from Fields Principal Sponsoring/Affiliate Universities, visiting scientists, or researchers in industry. Students accepted for the Program will have most of their travel and on-site expenses covered by the Institute. For more information on the program, please visit http://www.fields.utoronto.ca/activities/17-18/2017-fusrp. This entry was posted in Uncategorized on January 31, 2017 by sm. This entry was posted in Uncategorized on September 9, 2016 by Blog Administrator. The Ramanujan Prize Selection Committee has announced that the 2016 Ramanujan Prize for Young Mathematicians from Developing Countries will be awarded to Chenyang Xu of Beijing International Center of Mathematical Research in China. The prize is in recognition of Xu’s outstanding works in algebraic geometry, notably in the area of birational geometry, including works both on log canonical pairs and on Q-Fano varieties, and on the topology of singularities and their dual complexes. For more information, see the ICTP announcement below. This entry was posted in Uncategorized on June 22, 2016 by sm. The IMU is today launching the novel IMU Breakout Graduate Fellowship Program. Thanks to a generous donation by the winners of the Breakthrough Prizes in Mathematics – Ian Agol, Simon Donaldson, Maxim Kontsevich, Jacob Lurie, Terence Tao and Richard Taylor – IMU with the assistance of FIMU and TWAS is today launching a fellowship program to support postgraduate studies in a developing country, leading to a PhD degree in the mathematical sciences. The IMU Breakout Graduate Fellowships will offer a limited number of grants for excellent students from developing countries. The deadline for nominations is 09:00 am CET on 22 June 2016. Further information can be found in the Press Release and the Breakout Graduate Fellowship Call for Nomination, see below . This entry was posted in Uncategorized on April 25, 2016 by sm. The IMU Executive Committee (EC) held its annual meeting at the Research Institute for Mathematical Sciences (RIMS), Kyoto University, Japan, on Saturday/Sunday April 2/3, 2016. In conjunction with this meeting EC members gave talks at RIMS and the Kyoto University, see http://www.kurims.kyoto-u.ac.jp/~kenkyubu/ktgu-imu-math.html. This entry was posted in Uncategorized on April 6, 2016 by sm. This entry was posted in Uncategorized on March 15, 2016 by sm. The Symposium will be centered on the work of Stanislav Smirnov (Fields Medal 2010), and its current and potential impact. His research focuses on the fields of complex analysis, dynamical systems, and probability theory. The scientific program is aimed at a wide audience, including graduate students, mathematicians in other research areas, and scientists who use mathematics in an important way. The public opening of the Symposium will feature two mathematics lectures, one which will be given by Stanislav Smirnov. The Symposium will also have a special event for high school and undergraduate students. October 19 – Public Opening with Stanislav Smirnov, Isabel Bader Theatre, 7:00 p.m. This entry was posted in Uncategorized on September 27, 2015 by Blog Administrator. The Ramanujan Prize Selection Committee has announced that the 2015 Ramanujan Prize for Young Mathematicians from Developing Countries will be awarded to the Indian mathematician Amalendu Krishna in recognition of his outstanding contributions in the area of algebraic K-theory, algebraic cycles and the theory of motives. For more Information, see the ICTP announcement. This entry was posted in Uncategorized on August 3, 2015 by sm. The International Mathematical Union released a Call for Bids for ICM 2022 together with ICM Bidding Guidelines which provide advice and instructions to potential bidders. For a bid to be considered by the Site Selection Committee (SSC) of IMU it must be received no later than November 30, 2016. This entry was posted in Uncategorized on July 31, 2015 by sm. This entry was posted in Uncategorized on March 25, 2015 by sm. 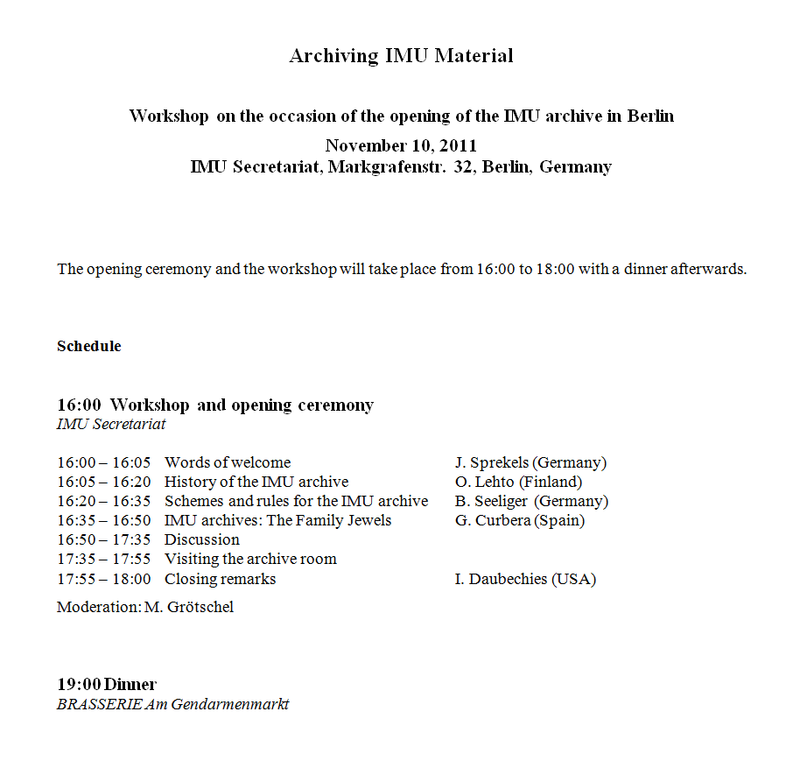 The IMU Executive Committee (EC) held its annual meeting at the IMU Secretariat in Berlin on Saturday/Sunday March 14/15, 2015. On Thursday/Friday March 12/13, 2015 there was a meeting of the IMU Commission for Developing Countries (CDC) in the IMU Secretariat. The IMU EC and the CDC had a joint meeting on Friday in order to discuss major issues of activities and the collaboration of the EC and CDC in the past, present and future. On Saturday/Sunday March 21/22, 2015 the IMU Committee on Information and Communication (CEIC) will also meet in the premises of the IMU Secretariat. This entry was posted in Uncategorized on March 20, 2015 by sm. The five IMU prizes of 2014 have been awarded on August 13, 2014 during the Opening Ceremony of ICM 2014 in Seoul, Republic of Korea by Park Geun-hye, the Honorable President of Korea. Information about the 2014 winners can be found HERE (http://www.mathunion.org/general/prizes/2014). This entry was posted in Uncategorized on August 13, 2014 by Blog Administrator. The International Congress of Mathematicians 2014 (ICM 2014) has been opened by Park Geun-hye, the Honorable President of Korea. For information about the congress, the program, etc. click HERE (http://www.icm2014.org/). The IMU Executive Committee, the Commission for Developing Countries (CDC), and the IMU members of the joint International Commission on the History of Mathematics (ICHM) for 2015-2018 have been elected. Shigefumi Mori will be the next IMU President, Helge Holden the next IMU Secretary. Click here to view the new IMU leadership. Rio de Janeiro, Brazil, has been chosen as the site of ICM 2018, this congress will take place on August 7-15, 2018. São Paulo will be the location of the 18th meeting of the IMU General Assembly. More information can be found in the ICM 2018 bid book. Papua New Guinea and Senegal were admitted as new IMU Associate Members. The General Assembly has endorsed many guidelines, and in particular the document Recommendation on the evaluation of individual researchers in the mathematical sciences written by an ad-hoc committee set up by the IMU EC. This entry was posted in Uncategorized on August 12, 2014 by Blog Administrator. The last meeting of the Executive Committee of the International Mathematical Union during the term 2011-2014 has terminated in Gyeongju, Republic of Korea. The most important issues were the final preparations of the meeting of the IMU General Assembly (August 10-11, 2014, also in Gyeongju), the MENAO Symposium on August 12, and the International Congress of Mathematicians 2014. This entry was posted in Uncategorized on August 9, 2014 by Blog Administrator. The symposium will explore the distribution of mathematical talent and the opportunities to develop that talent as well as the intellectual and economic consequences arising from this distribution. It is postulated that mathematical talent is spread more or less equally between all nations and peoples, but the opportunities to develop this talent is concentrated in developed nations. The MENAO symposium will highlight countries and regions that have, within a relatively short period of time, seen immense improvements in economic development and societal well-being and explore the relationship between this development and the mathematical understanding of the nations in question. The event, hosted by the International Mathematical Union (IMU), will bring potential sponsors and cooperation partners together with projects and organizations related to mathematics in developing countries. Highlighting past achievements and identifying future opportunities will also be part of the program. The day-long symposium will include an overview of the development of mathematics in Korea and Chile, and its relationship with economic development, talks from senior economists from Stanford and Cambridge and Fields medallists and mathematicians from a variety of developing countries. Participants will include international organisations like UNESCO and ICSU, foundations like Simons Foundation, Heidelberg Laureate Forum Foundation and Klaus Tschira Foundation, Japan International Cooperation Agency (JICA), National Board for Higher Mathematics (NBHM, India), German Research Foundation (DFG), German Academic Exchange Service (DAAD), Alexander von Humboldt-Foundation (AvH), Fraunhofer-Gesellschaft, Netherlands Organisation for Scientific Research (NOW), ministers, ambassadors and other interested parties. This entry was posted in Uncategorized on July 30, 2014 by Blog Administrator. The Commision for Developing Countries (CDC) has released three reports on the state, challenges and opportunities of mathematics in developing regions: Africa, Southeast Asia, and Latin America and the Caribbean. The report The INTERNATIONAL MATHEMATICAL UNION in the DEVELOPING WORLD: Past, Present and Future, commissioned by The Friends of IMU (FIMU) and the Commission for Developing Countries (CDC) has been released. This entry was posted in Uncategorized on July 29, 2014 by Blog Administrator. The Norwegian Academy of Science and Letters has decided to award the Abel Prize for 2014 to Yakov G. Sinai, Princeton University, USA, and Landau Institute for Theoretical Physics, Russian Academy of Sciences, “for his fundamental contributions to dynamical systems, ergodic theory, and mathematical physics”. This entry was posted in Uncategorized on March 26, 2014 by sm. The ICWM 2014 is an associated meeting of the International Congress of Mathematicians 2014 (ICM 2014) that will take place from August 13-21, 2014 in Seoul, Korea. The ICWM 2014 (http://www.kwms.or.kr/icwm2014) consists of two days of activities of which the first one is scheduled for August 12, 2014 at Ewha Womans University and the second for August 14, 2014 at the COEX Convention Center in Seoul, Korea. Please see the attached announcement for more information. This entry was posted in Uncategorized on January 8, 2014 by sm. Today, September 22, 2013 is the official opening of the Heidelberg Laureate Forum 2013. The Forum is the first of its kind, it gathers prominent scientists from the fields of mathematics and computer science, who are Abel, Fields and/or Turing laureates, and outstanding young researchers for a one week conference in the city of Heidelberg, Germany. For more information about the laureates, the Forum and the conference program see http://www.heidelberg-laureate-forum.org/. This entry was posted in Uncategorized on September 22, 2013 by sm. The Simons Foundation has made a three years grant to IMU’s Commission for Developing Countries (CDC) to support mathematicians working in a developing or economically disadvantaged country (as determined by the IMU) to travel to a center of excellence in any part of the world for collaborative research, see http://www.mathunion.org/cdc/about-cdc/news-and-events/. This entry was posted in Uncategorized on September 16, 2013 by sm. The list of plenary and invited speakers of ICM 2014 in Seoul, Korea, is now posted on the ICM homepage. For the list of plenary speakers see http://www.icm2014.org/en/program/scientific/plenary, the list of sectional speakers can be found at http://www.icm2014.org/en/program/scientific/section. This entry was posted in Uncategorized on September 5, 2013 by sm. The Ramanujan Prize Selection Committee has announced that the 2013 Ramanujan Prize will be awarded to Ye Tian, Academy of Mathematics and Systems Science, Chinese Academy of Sciences, China, in recognition of his outstanding contributions to Number Theory. For more Information, see the ICTP announcement. This entry was posted in Uncategorized on June 17, 2013 by sm. The Niels Henrik Abel Board and the International Mathematical Union are pleased to announce the “Abel Visiting Scholar Program”. The program invites mathematicians professionally based in developing countries to visit an international research collaborator for a period of one month. The period is extendable for up to three months in the case of matching support from the host institution. Up to three mathematicians per year will be supported. The program is designed for post doctoral mathematicians in the early stages of their professional careers. It is designed to offer the opportunity for a “research sabbatical”, a necessary complement to teaching and other academic duties for mathematicians desiring to also sustain a viable research program. Basic Requirements: Applicants must hold a PhD in Mathematics and be in the early stages of their professional careers. This means that the applicant should be under 40 years on July 1st, 2013 and not yet of full professorial rank. The maximum age may be increased by up to three years in the case of an individual with a broken career pattern. Applications from women mathematicians are strongly encouraged. The applicant should already have initiated research contact with the proposed international research partner. The collaboration should take place at the international partner’s home institution. Financial Support: The grant will cover health insurance, visa cost, all travel (economy flights or equivalent) and living expenses including accommodation for one month for up to a total maximum amount of USD 5,000 per mathematician. The Abel Visiting Scholar Program is administered by the Commission for Developing Countries (CDC) of the International Mathematical Union. A selection committee decides which applications are successful. More information can be found here: http://www.mathunion.org/cdc/grants/abel-visiting-scholar-program/. This entry was posted in Uncategorized on May 29, 2013 by sm. The Norwegian Academy of Science and Letters has decided to award the Abel Prize for 2013 to Pierre Deligne, Institute for Advanced Study, Princeton, New Jersey, USA “for seminal contributions to algebraic geometry and for their transformative impact on number theory, representation theory, and related fields”. This entry was posted in Uncategorized on March 20, 2013 by sm. by a gathering of the members of the Commission for Developing Countries and several guests. The IMU EC and CDC jointly decided, e.g., to host with the support of the ICM 2014 organizers a MENAO event (MENAO stands for “Mathematics in Emerging Nations: Achievements and Opportunities”) on August 12, 2013 in Seoul, Korea, aiming at finding additional support for mathematics in developing countries. This entry was posted in Uncategorized on March 13, 2013 by sm. On March 5, 2013 the Mathematics of Planet Earth 2013 (MPE2013) initiative has its official European launch in Paris. In parallel the Mathematics of Planet Earth Exhibition is started. The event is organized by UNESCO and the International Mathematical Union (see press release). This entry was posted in Uncategorized on March 5, 2013 by sm. The Fields Institute in Toronto, Canada will soon launch an annual event called the FIELDS MEDAL SYMPOSIUM, that will focus on the work of mathematicians honored by a Fields Medal. The Inaugural Fields Medal Symposium, entitled Fundamentals of the Langlands Program, will be held on October 15-18, 2012. It will be centered on the work of Ngô Bào Châu, and its current and potential impact. This entry was posted in Uncategorized on September 19, 2012 by imu-news. The final report about the Future World Heritage Digital Mathematics Library Symposium that was held at the National Academy of Sciences (NAS) in Washington, DC, on June 1-3, 2012, organized by IMU’s Committee on Electronic Information and Communication (CEIC) is now available. This entry was posted in Uncategorized on August 23, 2012 by imu-news. The Ramanujan Prize Selection Committee has announced that the 2012 Ramanujan Prize will be awarded to Fernando Codá Marques, Instituto Nacional de Matemática Pura e Aplicada, Rio de Janeiro, Brazil in recognition of his several outstanding contributions to Differential Geometry. This entry was posted in Uncategorized on June 25, 2012 by imu-news. In a letter to the IMU Adhering Organizations IMU President Ingrid Daubechies invites nominations for the IMU Prizes (Fields Medal, Rolf Nevanlinna Prize, Carl Friedrich Gauss Prize, Chern Medal Award, and Leelavati Prize sponsored by Infosys) and the ICM 2014 Emmy Noether Lecture to be awarded at ICM 2014. Nominations should be sent to the chairs of the respective selection committees observing the nomination guidelines. This entry was posted in Uncategorized on May 30, 2012 by imu-news. Starting in September 2013, the “Heidelberg Laureate Forum” will bring together winners of the Abel Prize, the Fields Medal, the Nevanlinna Prize, and the Turing Award with young scientists from all over the world. The meeting will be held in Heidelberg, it is established and sponsored by the Klaus Tschira Foundation and organized in collaboration with the Association for Computing Machinery (ACM; Turing Award), the International Mathematical Union (IMU; Fields Medal and Nevanlinna Prize), and the Norwegian Academy of Science and Letters (DNVA; Abel Prize). The meeting is modeled after the annual Lindau Nobel Laureate Meetings established more than 60 years ago. Press releases (in English and in German) of the event in Oslo, where the cooperation was established today, outline the plan in more detail. This entry was posted in Uncategorized on May 22, 2012 by imu-news. On April 30, 2012, for the first time in the history of Nepal, a special celebration was staged to pay homage to six senior mathematicians who have served the country for more than 50 years and who are over 75 years of age. The prime minister of Nepal, Dr. Baburam Bhattarai, honored them in a grand ceremony that was followed by a parade around Kathmandu in open vehicles with a music band followed by other mathematicians, students, and admirers. Photos can be found here. This entry was posted in Uncategorized on April 30, 2012 by imu-news. The IMU Executive Committee held its annual meeting at IMPA, Rio de Janeiro, April 22-23, 2012. The EC appointed, for instance, all committees for IMU prizes. The chairs of the prize committees will be made public as soon as all committee members have accepted the request to serve. This entry was posted in Uncategorized on April 23, 2012 by imu-news. Journal prices have been, since the beginning of the electronic publication age, an intensely discussed hot topic. Tim Gower’s call to action “Elsevier — my part in its downfall” in January 2012 started a boycott against Elsevier running under the title “The Cost of Knowledge”. This movement has gained significant momentum and lead almost 10.000 researcher so far to sign a boycott list. The paper “Mathematicians take a stand” by Douglas N. Arnold and Henry Cohn that will appear in the Notices of the AMS was just released on the arXiv, see arxiv.org/abs/1204.1351. The authors survey the ongoing Elsevier boycott, examine pricing and bundling, and lapses in ethics and peer review. They conclude with thoughts about the future of mathematical publishing. This entry was posted in Uncategorized on April 10, 2012 by imu-news. The Norwegian Academy of Science and Letters has decided to award the Abel Prize for 2012 to Endre Szemerédi, Alfréd Rényi Institute of Mathematics, Hungarian Academy of Sciences, Budapest, and Department of Computer Science, Rutgers, The State University of New Jersey, USA “for his fundamental contributions to discrete mathematics and theoretical computer science, and in recognition of the profound and lasting impact of these contributions on additive number theory and ergodic theory”. For more information about the laureate, his achievements and the Abel Prize, visit the Abel Prize website http://www.abelprisen.no/en/. This entry was posted in Uncategorized on March 21, 2012 by imu-news. The Ramanujan Prize Selection Committee has announced that the 2011 Srinivasa Ramanujan Prize will be awarded to Philibert Nang, University of Libreville, Gabon in recognition of his outstanding contributions to the algebraic theory of D-modules. The prize is also in recognition of Dr. Nang’s determined pursuit of high level research while engaged in an academic career in his home country of Gabon, Africa. This entry was posted in Uncategorized on January 16, 2012 by imu-news. John Ball, Oxford Centre for Nonlinear PDE, Mathematical Institute of the University of Oxford, was elected Ordinary Member of the Executive Board of ICSU (International Council for Science) at ICSU’s 30th General Assembly in Rome, Italy. John Ball who is Past President of the International Mathematical Union is the first ever mathematician on this board. He will be in office until 2014 when the next ICSU General Assembly will take place. This entry was posted in Uncategorized on September 30, 2011 by imu-news. As part of the Capacity and Networking Project (CANP), a workshop called EDIMATHS is taking place in Mali, from the 19th-30th September 2011 at the University of Bamako. The workshop is supported by UNESCO, IMU, CIMPA, SCAC/Bamako, the Ministre de l’Éducation, de l’Alphabétisation et des Langues Nationales and the Ministre de l’Enseignement Supérieur et de laRecherche Scientifique du Mali. CANP is the major development initiative of the International Commission for Mathematical Instruction (ICMI). It aims to provide regional development for mathematics teacher educators, enhancing the mathematical and pedagogical potential of the region. More information here. This entry was posted in Uncategorized on September 21, 2011 by imu-news. Today the IMU celebrates its 60th anniversary after its rebirth in 1951. On September 10, 1951 Börge Jessen (Denmark) announced to the National Adhering Organizations that the Union was officially established after ten countries had joined the Union (see page 86 of Olli Lehto’s book “Mathematics without borders, a history of the International Mathematical Union”). This entry was posted in Uncategorized on September 10, 2011 by imu-news. The International Mathematical Union (IMU) and the International Council for Industrial and Applied Mathematics (ICIAM) jointly constituted a Working Group on Journal Ranking. The Working Group has finished its work and produced a Report which is now electronically available. The report was discussed in a minisymposium at ICIAM 2011 in Vancouver. IMU and ICIAM have afterwards decided to start a blog on Journal Ranking in the fall of 2011. Note added: The blog on mathematical journals was opened on November 18, 2011. Please contribute to the discussion. This entry was posted in Uncategorized on August 30, 2011 by imu-news. The Ramanujan Prize was awarded today to Yuguang Shi from Peking University, China during a ceremony at ICTP in Trieste. This entry was posted in Uncategorized on May 10, 2011 by imu-news. The Norwegian Academy of Science and Letters has decided to award the Abel Prize for 2011 to John Milnor, Stony Brook University, NY “for pioneering discoveries in topology, geometry and algebra”. For more information about the laureate, his achievements and the Abel Prize, visit the Abel Prize website www.abelprisen.no/en/. This entry was posted in Uncategorized on March 23, 2011 by imu-news. On the occasion of the establishment of the IMU Secretariat in Berlin a grant program, called IMU Berlin Einstein Foundation Program (EFP) has been established aiming at the support of interactions of young mathematician from developing and economically disadvantaged countries with the lively mathematical environment in Berlin. This entry was posted in Uncategorized on February 1, 2011 by imu-news. The permanent IMU Secretariat has been opened today at the Weierstrass Institute in Berlin, Germany. Press releases and media reports (tv, radio, newspapers) about the event and photos can be found here. The Ramanujan Prize Selection Committee has announced that the 2010 Srinivasa Ramanujan Prize will be awarded to Professor Yuguang Shi of the School of Mathematical Sciences, Peking University. This entry was posted in Uncategorized on January 28, 2011 by imu-news. The International Mathematical Union disseminates a press release announcing the final version of the document ‘Best Current Practices for Journals’ produced by IMU´s Committee on Electronic Information and Communication (CEIC) and endorsed by IMU’s General Assembly. This entry was posted in Uncategorized on September 2, 2010 by imu-news. During the ICM 2010 Opening Ceremony, the International Mathematical Union has inaugurated the server http://www.mathunion.org/ICM which provides access, free of charge, to the articles in all ICM proceedings volumes since the beginning of this series of congresses. IMU is grateful to all publishing houses that have granted the right to digitize these books. IMU particularly appreciates the work of R. Keith Dennis (Cornell University) and Ulf Rehmann (Universität Bielefeld) who have volunteered to digitize the articles. This entry was posted in Uncategorized on August 19, 2010 by imu-news. The IMU Executive Committee, the Commission for Developing Countries (CDC), and the IMU members of the Joint International Commission on the History of Mathematics (ICHM) for 2011-2014 have been elected. Ingrid Daubechies will be the next IMU President, click here to view the new IMU leadership. Seoul, Republic of Korea, has been chosen as the location of ICM 2014, this congress will place in the second half of August 2014. Gyungju will be the location of the next General Assembly. 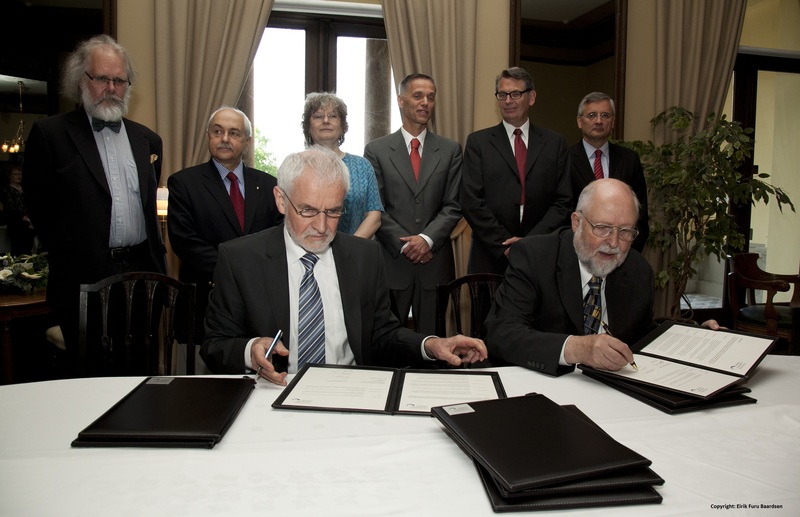 The Weierstrass Institute Berlin, Germany, will host the permanent office of IMU. The new office will take up its operation in January 2011. Montenegro became a new IMU Member, Cambodia, Moldova, Nepal, and Oman became new IMU Associate Members, the South-East Asia Mathematical Society became a new IMU Affiliate Member. The General Assembly has endorsed the document ‘Best Current Practices for Journals‘ produced by IMU´s Committee on Electronic Information and Communication (CEIC). This entry was posted in Uncategorized on August 17, 2010 by imu-news. This entry was posted in Uncategorized on June 18, 2010 by imu-news. The International Mathematical Union has produced an information brochure with a survey of all current IMU activities. The printed version of this booklet will be distributed to all participants of the International Congress of Mathematicians 2010 in Hyderabad. This entry was posted in Uncategorized on June 15, 2010 by imu-news. The Norwegian Academy of Science and Letters has decided to award the Abel Prize for 2010 to John Torrence Tate, University of Texas at Austin “for his vast and lasting impact on the theory of numbers.” For more information about the laureate, his achievements and the Abel Prize, visit the Abel Prize website www.abelprisen.no/en/. This entry was posted in Uncategorized on March 24, 2010 by imu-news. This entry was posted in Uncategorized on December 22, 2009 by imu-news. The International Mathematical Union is offering now videos that were recorded at the International Congresses of Mathematicians in 1998, 2002, and 2006. These videos show the opening ceremonies, most of the plenary lectures, and other major events. They can be viewed and are free for download. This entry was posted in Uncategorized on July 15, 2009 by imu-news. The International Mathematical Union (IMU) and the Chern Medal Foundation (CMF) jointly launch a new mathematical prize, the Chern Medal Award, in memory of the outstanding mathematician Shiing-Shen Chern. The Award is to be given to an individual whose lifelong outstanding achievements in the field of mathematics warrant the highest level of recognition. It consists of a medal and a monetary award of US$ 500,000. Half of the amount shall be donated to organizations of the recipient’s choice to support research, education, outreach, or other activities to promote mathematics. For more information see the Press Release and the Chern Medal Program Guidelines (which also inform about the nomination procedure). The Chern Medal will be awarded for the first time at the opening ceremony of ICM 2010 in Hyderabad, India on August 19, 2010. This entry was posted in Uncategorized on June 1, 2009 by imu-news. This entry was posted in Uncategorized on May 8, 2009 by imu-news. The International Mathematical Union (IMU), together with the John Templeton Foundation, releases a brief report “Mathematics in Africa: Challenges and Opportunities” on the current state of mathematics in Africa and on opportunities for new initiatives to support mathematical development. The study was prepared by IMU’s Developing Strategies Group and financed by the John Templeton Foundation. This entry was posted in Uncategorized on April 2, 2009 by imu-news. This entry was posted in Uncategorized on March 26, 2009 by imu-news. The 2008 Srinivasa Ramanujan Prize has been awarded to Enrique R. Pujals, Associate Researcher at the Instituto Nacional de Matemática Pura e Aplicada (IMPA), Brazil. This entry was posted in Uncategorized on October 24, 2008 by imu-news. This entry was posted in Uncategorized on September 11, 2008 by imu-news. IMU has released, in cooperation with ICIAM and IMS, the report “Citation Statistics” which analyzes the use and misuse of citation data in the assessment of scientific research, see also IMU-Net 29b of June 2008 and the corresponding press release. The report discusses, in particular, the impact factor, the h-index and variants of these that are often employed to rank not only journals but also individuals, departments, or whole institutions and is available for republication. This entry was posted in Uncategorized on August 11, 2008 by imu-news. If you are interested in ICM 2010 in Hyderabad in India, go to the ICM 2010 server for information at present. This entry was posted in Uncategorized on May 5, 2008 by imu-news. The next IMU Executive Meeting will be held on April 18-19, 2009 in Fuzhou, China. This entry was posted in Uncategorized on April 21, 2008 by imu-news. The International Council of Industrial and Applied Mathematics (ICIAM), the Institute of Mathematics and Statistics (IMS), and the International Mathematical Union (IMU) have formed a Committee of “Quantitative Assessment of Research” that will investigate various aspects of the quantitative assessment of research in mathematics. The Committee will, in particular, look into impact factors and similar ways to measure research output. John Ewing (Providence, USA), appointed by IMU. The Committee is expected to create a summary of its findings to be endorsed by the Executive Committees of ICIAM, IMS, and IMU and to be published afterwards. ICIAM, IMS, and IMU have formulated an aspirational charge to help set direction rather than prescribe the final outcome of the committee’s work. This entry was posted in Uncategorized on May 21, 2007 by imu-news. The IMU secretariat has been moved to the Konrad-Zuse-Zentrum für Informationstechnik Berlin (ZIB) for the years 2007 – 2010. This entry was posted in Uncategorized on January 1, 2007 by imu-news. ICM 2006 opened and IMU Prizes awarded Speech of IMU President John Ball at the Opening Ceremony in PDF. This entry was posted in Uncategorized on August 22, 2006 by imu-news. This entry was posted in Uncategorized on February 20, 2005 by imu-news. This entry was posted in Uncategorized on July 8, 2004 by imu-news.